Since you have heard from me about the adventures leading up to the Foot Forward Summit including the welcome and education on Day 1, I thought you might enjoy hearing from #BFFmel about Day 2! After attending the Reception on Sunday evening, Holly and I were looking forward to hearing the presenters on Monday. Breakfast was provided for the attendees, and everyone met in the Exhibitor’s room to start the day. 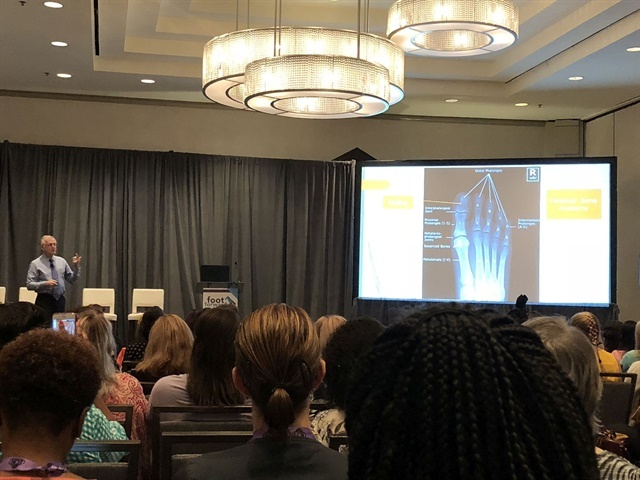 After the introduction and welcome by the NAILS Magazine staff, the first presenter was Dr. Bruce Pichler of the Dahlonega Foot and Ankle Clinic to discuss Identifying Common Foot Conditions. Dr. Pichler has been a podiatrist since 1982 and currently resides in the Atlanta area — he had a private practice in Des Moines, Iowa for several years. This was notable to me because I live in Des Moines! Dr. Pichler said that we were a much more colorful audience compared to the doctors he usually gives presentations to. He also had pictures to share of foot problems that ranged from common to extreme, some of which were not for the faint of heart. A topical antibiotic, such as Neosporin, will make an infected toenail worse. A foot soak of 2 cups Epsom salt, 1 gallon room temperature water, and 1/2 cup vinegar for 30 minutes per day should be used instead. Most discolored nails are not infected with fungus. A fungus can only be diagnosed by performing a culture. A nail technician has the ability to save a client’s life by looking for skin cancer. Every nail tech should know the ABCDE’s of skin cancer: Asymmetry, Border, Color, Diameter, and Evolution. In NinaDawn’s experience, the time she spent working in the podiatrist’s office was beneficial to the doctor, the patients, and herself. She said she had a no tipping policy, but patients would still try to tip her to show their gratitude for the service she provided. Next was Vicki Malo with Footlogix on How to Use Toenail Braces to Increase Profit and Client Satisfaction. A Toenail Brace is a made of fiberglass, very similar to a Breathe Right strip that is attached to the nail plate with an adhesive. The system is designed to help the toenail that has started to develop a curvature that’s causing pressure and discomfort to grow out less curved, relieving the pressure. The brace is designed to be worn under polish. Vicki demonstrated how to apply the brace so the attendees could see how easy it is to perform this service. Vicki also spoke after lunch discussing How to Take Steps to Ensure Safe Pedicure Practices. This talk included a discussion of in-depth consultations, pedicure implements, e-files, and bits for pedicure services. Then came Denise Baich with Pedicure Plus and Nellie Neal of The Pedi Lab on How Toenail Reconstruction Can Build Revenue. 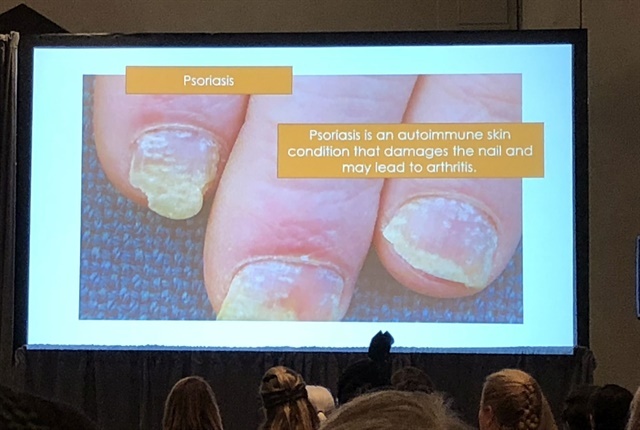 They demonstrated how the LCN Toenail Reconstruction System, which is a UV gel resin product, is used to sculpt a natural looking toenail that flexible, claims to be safe for contact on the skin, and will not give the client a “heat spike” when curing. A key ingredient is Piroctone, which according to Wikipedia, is an ingredient that is sometimes used in the treatment of fungal infections. When completed, polish or gel-polish can be applied to finish the look. Nellie’s social media has many examples of the reconstructions he has performed, then added glitter of course! Nellie stated that the key benefit for him is that it has given him to ability to send a client back to their doctor and show how he has been able to help their patients have beautiful toes after they received treatments. During the lunch break, Holly and I did our monthly Facebook Live Broadcast installment of #NailOn with Holly and Mel. We revealed our logo created for NailOn (you can read Holly’s blog to find the background story for NailOn), we had guests: NinaDawn Patton of Saiph Pro, Lorrie Ducharme of Prestige Salon Nails & Pedicures, and Gloria Williams, founder and CEO of Footnanny, to discuss their feelings on why events like the Foot Forward Summit are so important. We ended our broadcast with none other than Beth Livesay, the executive editor of NAILS Magazine! Beth shared how pleased she and the rest of the NAILS staff were with the inaugural Foot Forward Summit, why an event like this is so unique and important, and she also shared the news that there would be a Foot Forward Summit in 2019! Next year’s event will be back in fabulous Atlanta on August 11-13, 2019! Whew! Mel sure takes great notes! Come back tomorrow to catch what happened after lunch.